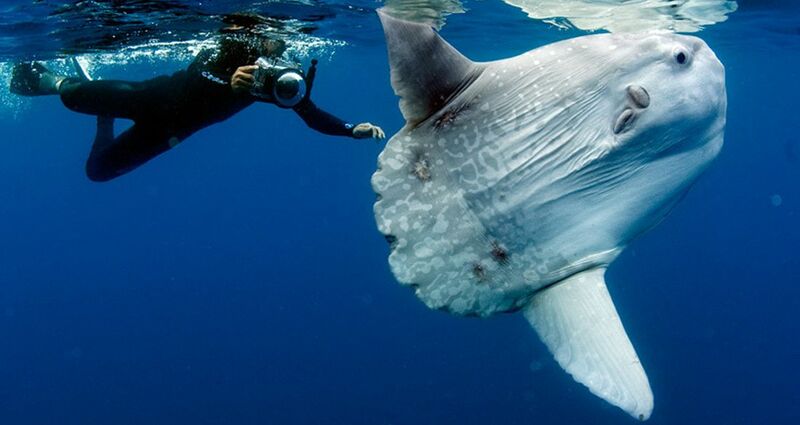 The Mola Mola, or ocean sunfish, is one of the world's heaviest bony fish, growing up to 5,000 pounds and 14 feet long. 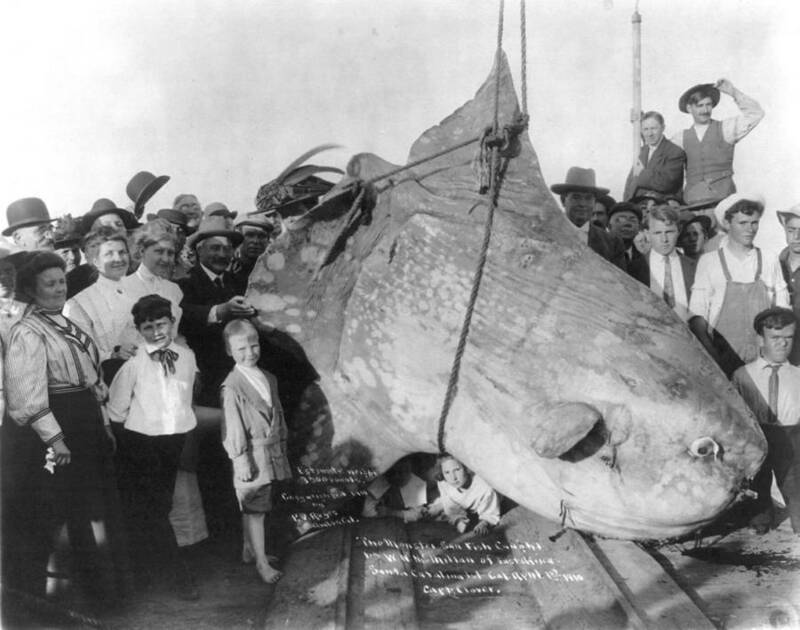 Wikimedia CommonsAn enormous ocean sunfish at 3,500 pounds, caught at Santa Catalina Island, April 1, 1910. The Grey family was out on a fishing trip, drifting along the southwest coast of Wales when a gigantic fish leaped out of the water. That fish looked like a freak of nature. It had a fish’s head but the body of a plate, or a flat board. As odd as the creature looked, it could soar above the so high into the air that the Grey family had to crane their necks to follow its flight into the sky. This was the strange flight of the Mola Mola fish or the ocean sunfish. As the ocean sunfish headed back for the earth hard and fast, the Greys quickly realized that it wasn’t headed for the water, but directly for their boat — and it was going to crash right on top of their four-year-old son. “It knocked him flying!” the boy’s parents later recalled. The four-year-old miraculously survived the collision with a gigantic, 66-pound flying fish-head, nearly knocking with little more than a few cuts and grazes — and a firsthand glimpse of one of the biggest and strangest animals in the sea: the Mola Mola. 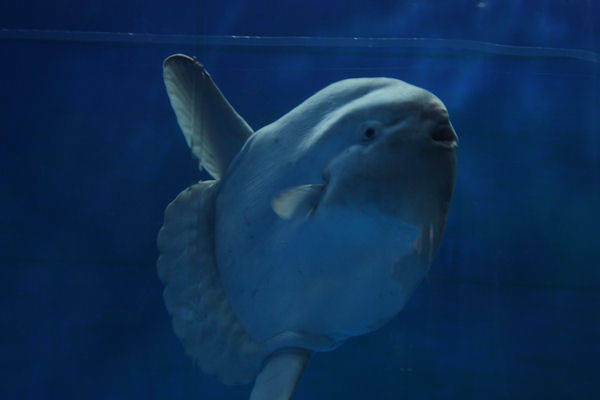 Wikimedia CommonsAn ocean sunfish in an aquarium in Japan. The Mola Mola that collided with the young Grey boy was actually relatively small for its species. Indeed, the ocean sunfish grows to become one of the heaviest fish in the world, beaten out only by a handful of sharks and the giant oceanic manta ray. Often, these fish will grow to be about 4,400 pounds or larger. To put that in perspective, that is as heavy as a rhinoceros, or slightly heavier than the average car. In a beautiful display of symbiosis, seagulls eat parasites off of an ocean sunfish, which are prone to parasitic infections. The ocean sunfish is so big that it’s all but impossible to raise them in captivity. Only a handful of aquariums around the world have a Mola Mola on display because the fish simply grows too quickly to be managed. One sunfish in the Monterey Bay Aquarium gained 800 pounds in just 14 months and forced the aquarium to airlift the gigantic creature out of its enclosure with a helicopter to be returned to the bay. And yet, for all that weight, they ocean sunfish is as flat as a pancake. The animal resembles a severed fish head with fins on the sides, awkwardly wiggling its way through the water with its mouth perpetually agape in an expression of confused surprise. It’s not something the ocean sunfish can control, though. Inside of those mouths, their teeth are fused together, forming something that looks like a parrot’s beak hidden behind its lips. The layer of teeth is so thick that the sunfish can never close its mouth. 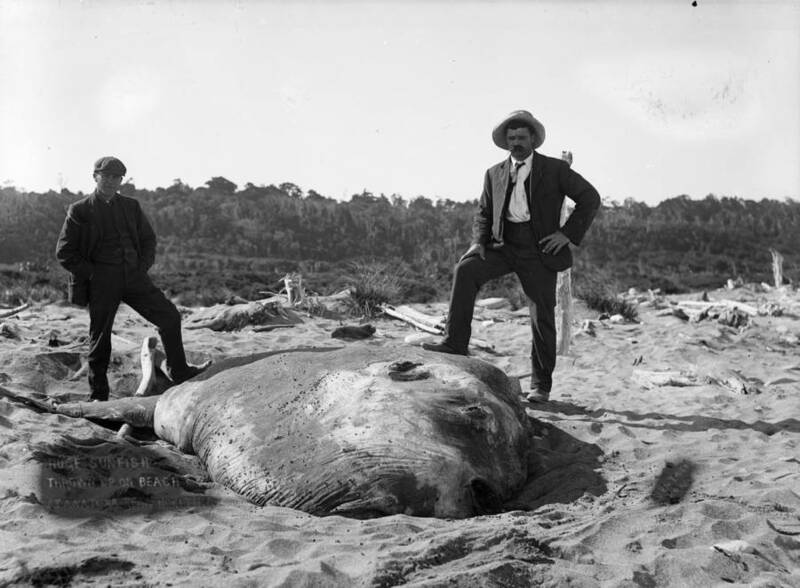 James Ring/Wikimedia CommonsA huge Mola Mola, washed up on the beach in Awatuna, New Zealand, Jan. 1, 1910. Few animals are large enough to dare to try to eat a Mola Mola – but there’s another threat altogether that’s landed them listed as a vulnerable species: human beings. Mola Molas are slow-moving creatures who prefer to spend their time near the surface, lying on their side, which is why they’re also referred to as the “ocean sunfish”.They may at first appear dead, but they’re actually having the time of their lives. Mola Molas love to sunbathe; they’ll creep up to the surface and lie down, basking in the sun’s rays. But because they’re not big on moving, these massive fish stay in place when human boats come by, and, quite often, they’ll end up getting smashed into by passing boats. Other than presenting a literal roadblock to passing boats, sunfish are harmless to humans. They are topsy-turvy swimmers and thus feast on easy-to-catch prey like jellyfish or small algae and zooplankton. But the sunfish truly comes into its own for a few brief moments midair. The ocean sunfish is one of the youngest fish species in the sea. As strange as they look, Mola Molas can be nothing short of beautiful. The sight that the Grey family saw off the coast of Wales wasn’t a once-in-a-lifetime view: Mola Molas, time and time again, will break through the surface of the water and leap into the air. These creatures, though some of which weigh well over a ton, can fly up to 10 feet into the sky. In part, the ocean sunfish jumps to shake off those many parasites that plague their bodies. Frequently, these creatures will have as many as 40 different species of parasites clinging to them at once. The Mola Mola fish is decreasing in population, and humans are in large part to blame. Careless man tries to ‘ride’ an unsuspecting sunfish. One man filmed himself leaping out of his boat and mounting the back of a gigantic Mola Mola, riding it like a horse while his friends laughed. This is just one of the threats to being a placid animal. Mola Molas get pulled into death traps time and time again. For instance, in Japan and Taiwan, the meat of an ocean sunfish is considered a delicacy. Fishermen chasing swordfish will often find their nets filled with the milling Mola Mola instead. 29 percent of fishermen bycatch is reported to be Mola Mola. Pollution poses another risk to the mild-mannered Mola Mola. As they do feed primarily on jellyfish, they can often mistake a plastic bag for food. These massive animals will swallow the bags whole and choke themselves to death. The Mola Mola who was ridden by a man off the coast of Mexico, though, got his own type of revenge. His body – like the bodies of most Mola Molas – was covered in parasites. When the man returned to the boat, he had to spend hours scraping them off. After this look at the bizarre ocean sunfish, learn about the Mariana snailfish, the world’s deepest fish. Then, check out this unnamed, horrible-smelling hairy creature that washed up on the shores of the Philippines.